Herbal medicine is the oldest medicine on the planet and still the preferred medicine of the greater population worldwide. More than 80% of the world’s population uses Herbals as mainstream medicine, according to the World Health Organisation. Cottage Hill Herbs ’Diploma of Herbal Studies’ is a unique way to study the uses and application of a wide range of herbs. Students work with the plants, grown organically, working from the ground up – learning practical methods of growing and use of herbs traditionally and clinically. We develop an intimate understanding of the plants when working with nature first hand. The aromas, scents and growth patterns speak to us and we each grow in an awareness of the other. 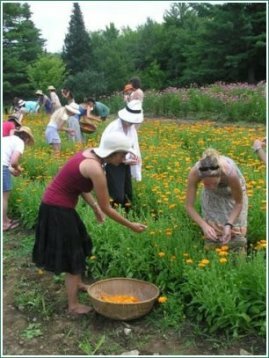 The Diploma of Herbal Studies is a year long part time study programme conducted from the Herb Farm, with small groups of students working together in harmony with the plants using organic methods of production. Dozens of plants, herbal extracts, teas, capsule making, tinctures, ointments, oil blends, flower essences and skin care products are produced over the year by each student, giving first hand knowledge of the best methods of production most suited to each individual herb and how best to extract the ‘principle’ and most potent forces from each plant. 11. Planting “Your Green Pharmacy”. Students enrolling in the Herbal Diploma are strictly limited to 8 students in total per course. Should a student be unable to complete the course, the course fee is still due and payable, as per enrolment conditions. Enrolments close as soon as the course is filled. Enrolment forms must be completed and deposit paid for enrollment to be accepted. Please click here to download an enrolment form.